What drew you to become a fashion designer? I’ve always been a very creative person; working with textiles just became my favourite medium. In high school I started curating & altering secondhand clothing (I would sell distressed cut off denim shorts out of my locker). I guess this hobby slowly morphed into the work I do now for CLAWDI. Why was it important to you to offer a sustainable, responsible, Eco fashion line and how do you incorporate ideals such a Zero Waste into your work? We are one of the first generations to have grown up in an era where sustainability is a huge topic of discussion. We are now aware of the direct impacts our actions have on the environment. To work in fashion & ignore the negative consequences was just never an option. I feel as though it is our duty to act & create change in a positive direction. It’s very inspiring to see the demand for sustainable alternatives in fashion grow. Waste is a design flaw, using what we already have available is my number one priority. I would rather eat my own shoes than add to the demand of producing ‘new’ material. It takes a little more creative problem solving & TLC to work with secondhand textiles (some need repairs as they are simply old or broken), although from my experience the challenges/possibilities only become more & more exciting. Secondhand stores are so rich with amazing fabrics. Where do you find inspiration for new work? My brain moves a thousand miles an hour so inspiration comes from anything & everything. I once saw a lady walking her dog wearing two bum bags, which led to a series of suits with detachable pockets. Designers all have their own unique design process; mine usually starts with a mood/message I want to communicate. Developing a concept, backed up with research is vital – during this stage I usually put together a playlist to support the mood/feel of the concept (music & fashion go hand in hand for me). What materials do you work with – organic, reclaimed, etc.? We already have too much of fast fashion ‘waste’ sitting in secondhand stores. Every piece I make is from 100% upcycled materials; sometimes it’s an old blanket, or tablecloth, deconstructed Levi’s denim, metal hardware from belts. There are endless opportunities to repurpose material in secondhand clothing stores you just need to get a little creative with how you apply it to a new design. What are the biggest challenges you face as a sustainable designer? The work is labor intensive; everything is handmade - some can take up to 20hrs with embroidery. I’m stubborn & insist on using only recycled so this also takes time for sourcing, cleaning, mending & preparing the materials. The biggest challenge would be competing with fast fashion brands/trends. I don’t necessarily want to compete with that side of the industry, I work almost entirely against it, and my aim is to help re-write the way we think of, understand and consume clothing. How do you help customers understand the higher cost of sustainable garments when they are so inundated with sweatshop-produced cheap merchandise? Almost everyday I find myself trying to justify my prices because I want my work to be affordable. Then you realize, the problem isn’t that eco-friendly fashion is so expensive, it’s why is fast fashion so damn cheap?? One Recycled Wool Coat can take at least 8 hours of labor & love. Now think of it this way, many consumers will walk into ZARA (etc.) & drop $200 on a new coat with no hesitation, so why do we need to justify spending $200 on one of a kind, handmade, sustainable pieces where the money goes directly to supporting a small positive business? I think that’s one of the ways fast fashion has played all of us. Fashion wasn’t always so cheap & accessible, we need to remember & respect the craftsmanship behind our clothing. 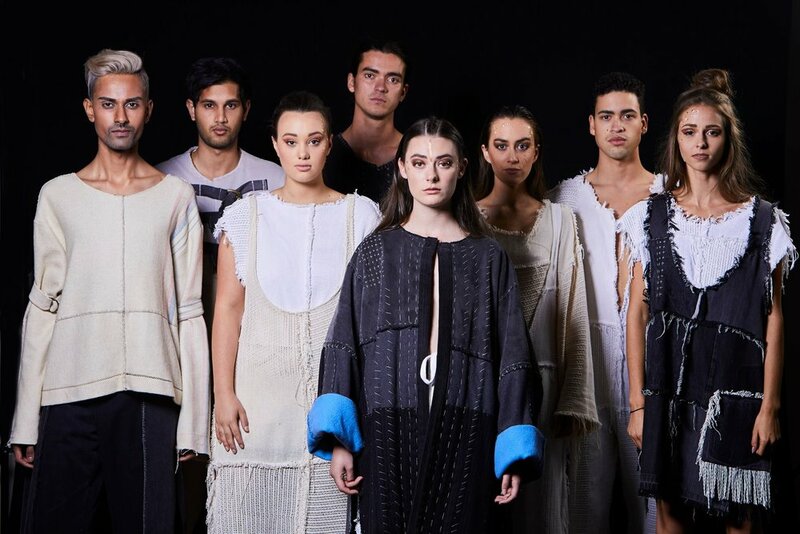 What can we look forward to seeing on the runway at Eco Fashion Week Australia? I’ll be showing a new collection called RECYCLED REVOLUTION. Over the last year I’ve focused on working with pure wool blankets, I am so obsessed with them! Yes, wool isn’t ideal for warm weather, but these blankets are iconic Australian & New Zealand textiles. I want to show how amazing they are & the possibilities that lie within using recycled textiles. This collection feels like the best representation of who I am & what I stand for as a designer. It’s loud, bursting with retro colours/prints from the vintage blankets, with a DIY/punk finish. I was very inspired by the era between 1974-1984, from glam rock icons, to Vivienne Westwood & the rise of punk, Freddie Mercury, ABBA & the disco craze, to Michael Jackson. It’s an interesting mix haha, I think I was drawn to this because it was a time of radical change. Similar to where we are now, we need to stand up & demand change for what we believe in & the important issues threatening our future. How do you incorporate sustainable living in other areas of your life? I try to live by ‘be kind & do good’, so protecting our fragile environment & the millions of species that also call our planet home is priority! I do my best by reducing waste, reusing whatever I can & recycle religiously. I am a bit of a hoarder when it comes to fabric scraps, I keep all my cut off waste, which I use later for various different things like labels, patches, sampling etc. My own wardrobe is almost entirely sourced from secondhand stores; I try to stick with my natural fibres, only invest in quality pieces & when something breaks – FIX IT! Anything else you would like readers to know? I have always said the future of the fashion industry lies in our ability to embrace sustainable design, without it there simply is no future for fashion. We cannot keep ignoring all the negative impacts. It is so important for designers & consumers to start making some positive changes, it really isn’t very hard to cut down on waste or make more ethical decisions.